Rockport Music’s mission is to enrich lives through exceptional live musical performances in an intimate setting and provide learning opportunities that deepen a love of music and connect artists and audiences. FIND OUT MORE ABOUT OUR DONOR BENEFITS! Rockport Music is a 501(c)(3), so your donations to the organization are tax-deductible. It’s easy to make a donation online! Send a check to: Rockport Music, ATTN: Development Office, 16 Main Street, Rockport, MA 01966. Simply call Development Associate, Yati McMahon at 978.546.7391 ext. 105 with your credit card information. Become a monthly donor and make a recurring gift of $10 or more per month. Any amount is meaningful. After your first monthly installment, we will charge your credit card on the last Monday of every month until you ask us to stop. For more information or to make your Sustaining Donor pledge, contact Yati McMahon, Development Associate, at 978.546.7391 ext. 105 or ymcmahon@rockportmusic.org. Many people choose to contribute by transferring securities rather than making a direct contribution of cash. Should you choose this method of giving, you will not pay any capital gains tax on your gift, and you may be able to claim a Federal income tax deduction based on the full fair market value of the securities on the effective date of your gift. For instructions on donating gifts of securities, review the document, Gifting Securities, or contact Mark Barrasso, at 978.546.7391 ext. 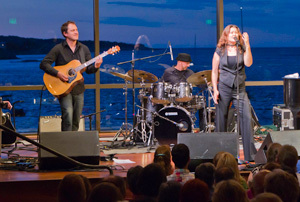 127 or mbarrasso@rockportmusic.org. Giving through your donor advised fund (DAF) allows you to combine the most favorable tax benefits with the flexibility to support your favorite charities easily. Increasingly popular charitable vehicles, DAFs are an excellent way to both simplify your charitable giving and facilitate your strategic philanthropic goals. Corporate matching gifts are a great way for our supporters to maximize their personal contributions to Rockport Music and increase the impact of their gift. By taking advantage of a company’s matching gift benefit, you may be able to double or even triple the amount of your contribution. Complete and submit the form to Rockport Music along with your gift. Rockport Music will verify the completed form and return it to the company. The company issues a matching gift contribution to Rockport Music. Senior Development Officer, at 978.546.7391 ext. 132. If you purchased tickets to a concert you are unable to use, please consider donating them for resale by calling the Box Office at 978.546.7391. If we are able to resell your tickets, you will receive a receipt for tax purposes and you will give other music lovers an opportunity to hear a stellar live performance. We are able to resell tickets only to sold-out performances. Ticket fees are not included in the donation.